The Library of the Seen: Kicking off Movember! Movember is when men donate their face to raising awareness for men's health. It began with focusing on testicular and prostate cancer and has grown to also raise awareness of men's mental health. 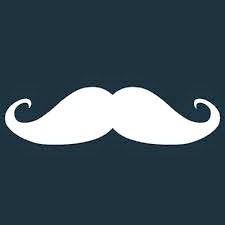 Men who participate shave their face at the beginning of November and spend the month growing an awesome 'stache and raise money for mens health programs. How will Library of the Seen Be Involved? Here at Library of the Seen we will be focusing on books that deal with the issue of Mental Health and YA males. There are so many books out there that talk about females with mental health issues but I feel like there aren't as many books out there about males dealing with these issues. I will also be having guest posts from men and some women about living with mental illness and hopefully some about living with testicular or prostate cancer as well. It is time that we shed the light on mental health and help erase the stigma that having a mental illness or seeking help somehow makes you less macho or manly. It will signify that the book I am reviewing deals with mental health issues. I want you to participate in Movember as well! So to reward you I will be hosting an awesome Movember themed giveaway!